RERA (Real Estate Regulatory Act 2016) was passed and came into force from May 1, 2016, to protect the interests of home buyers and also boost investments in the real estate sector. An initiative like RERA has been waiting to happen for a very long time due to the complaints of home buyers about the awry transactions in favour of the developers. RERA has been brought into force with the aim to create a fair transaction system between the seller and the buyer of properties. With RERA it is hoped that real estate purchases simpler due to the better accountability and transparency. The RERA will give the Indian real estate industry its first regulator by making it mandatory for each state and union territory, to form its own regulator and frame the rules to govern the functioning of the regulator. 70% of the projects fund will be parked in a separate reserve account and its proceeds can only be used towards land and construction expenses and will be required to be certified by a professional. 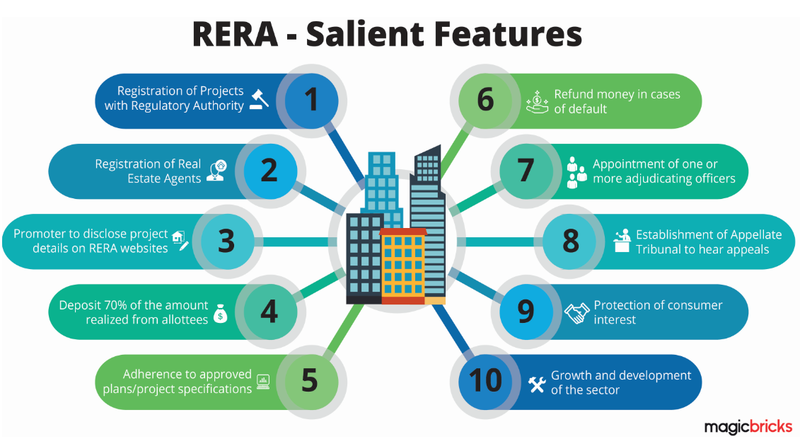 Home buyers will be able to monitor the progress of the project on the RERA website since promoters will be required to make periodic submissions to the regulator regarding the progress of the project. Promoters are required to positively warrant on her/his right title and interest on the land, to be used later against him by the home buyer, in case of any title defect is detected. Insurance against the title and construction of the projects is compulsory and its proceeds shall go to the allottee upon execution of the agreement of sale. Clauses against home buyers, penalising them for any default while similar defaults by the promoter attracted negligible or no penalty will be unacceptable. Violators will attract penalty (up to 10% of the project cost) and imprisonment. carpet area which is the area within four walls. If you’ve been thinking of investing then these are excellent facts for you to consider. Policy changes have enhanced investment opportunities, as well as ongoing real estate developments. Daiwik Housing offers you an unmatched opportunity to invest in India’s stable economy and an exceptional apartment.